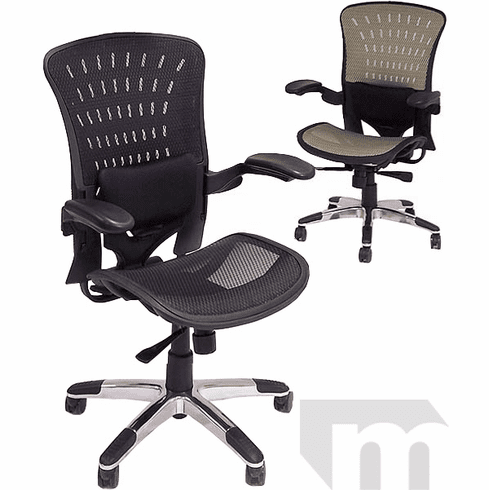 Ergonomic Mesh Office Seating - In Stock! Free Shipping! Here's the office chair everyone has been talking about. Inspired by an award winning A-Grade contract furniture chair, this top quality elastic mesh chair packages quality components and design at an unbeatable price. Adjustability and an elastic mesh seat and back are at the core of the Ergonomic Mesh Office Chair's superior comfort. The turn of a paddle easily custom fits the fore/aft and height positions of the lower lumbar position of your chair. Lock in your 2:1 tilt function mechanism for the task at hand or leave it in a comfortable rocking recline position that moves with your body. Another turn of a paddle adjusts your armrests to the perfect height. You will definitely appreciate the comfort and breathability provided by the high quality elastic mesh seat, back and headrest. 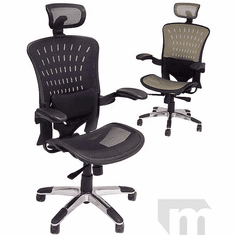 Choose from a businesslike Carbon Black or modern looking Latte Neutral mesh color. Elastic Mesh Seat and Back - uses the same elastic mesh as Grade A seating sold at 2-3 times the price. This comfortable mesh allows for complete airflow around the body. Fabric and leather seating causes the build up of heat resulting in general discomfort and restlessness while seated in your chair the majority of the day. Elastic mesh seating allows the air to pass through the chair freely and leaves the user feeling fresher. High quality elastic mesh also provides an excellent cushioning effect since it is suspended over a framework so you will never get that bottoming out feel of a condensed foam cushion or lesser quality fabric mesh. An elastic mesh will not sag or loose its form as fabric mesh may over time. Only top quality seating will make use of elastic mesh versus fabric mesh. 2:1 Heavy-Duty Synchro Tilt Mechanism - This superior mechanism allows the backrest to recline at a 2 :1 ratio with the angle of the seat. It also moves the tilting pivot point forward so as you recline there is little to no pressure on the hamstring area. This allows for better circulation in the legs. A tilt tension adjustment is easily adjusted to balance the spring tension to the weight of the user from 120 to 350 lbs. Adjustable Padded Armrests - Cantilevered armrests are easily raised and lowered by release a tension paddle at the side of the chair, moving the arm to the desired height, and then locking the paddle back into position. Contoured forearm pads are both easy on the elbows yet durable for excellent wear. Fully Functional Lumbar Adjustment - The lower back area of the chair releases by a paddle and can rotate as far forward or back as the user requires. The backrest pad then slides up or down to an ideal position. Pneumatic Lift - Lower right paddle adjusts the seat height from 18" to 21" high at the seat center. 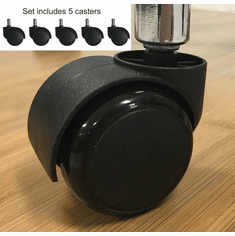 Base & Casters - A strong aluminum base with scuff protectors and 2-1/2" diameter oversized casters provide a firm foundation and smooth, easy mobility. See soft casters for hard floors below. User Sizing - The Evolution is sized for the medium to larger user up to 350 lbs. All components exceed ANSI/BIFMA commercial use requirements for chairs rated to 350 lbs. capacity. Seat measures 21-1/4"W x 20"D. Back is 23"W x 27"H. 29"W x 27"D x 41"-44"H overall. Ships unassembled. Shipping weight 60 lbs. PRICE INCLUDES FREIGHT! IN STOCK!